I don’t know if this is actually The Middle, but that’s how it feels. Anyway, this is what follows The Beginning, as posted on this website. It could also be called: Along the Way or In Process. It is what began, four or five years ago with a drawing pad on which I did randomly inspired drawings of food, encircled by writing, having a conversation with food; which itself grew out of a consulting business (AaCL) and the ‘discovery’ that everyone has a Food Life Story. This project has led me deeper and deeper into my self, my own story, my writing and healing. Other circumstances have aided and abetted this process. All of these gifts, these open doors, some arriving unbidden, but welcome, and some actively sought, have grown and expanded my inner and outer lives, producing changes. It was intended as promotion for the consulting business and in it’s way, it was satisfying. But I guess my heart wasn’t really in it; I’ve never been much for self-promotion. I was also blogging here on the EAW (Eating Art Work) site, journaling my way through the pages of drawings I had already done. Now that I think about it that was the beginning of the middle. The writing was personal, albeit carefully edited. Taking baby steps into the world: putting my words, thoughts and feelings out there. My story. That too was sometimes satisfying. Satisfying, however, is not, was not, fulfilling. I was not fed by the effort. Simultaneously, the needs of my elderly father and the miserable chain of our mutual his-tory were draining me. And the slightly appealing and slight success of an EAW Design business, producing and selling products using the drawings I had done, was distracting, as well as time-consuming. Were these distractions false turns, tangents and ‘wastes’ of time? I have thought that; I have railed against the draining, the siphoning off of my sap; to what end? Hindsight has made it clear that I had to complete that journey with my father, to the bitter end. After decades of submission to misery, I had to spend some time with him while I was aware of my anger. That was the only path to eventual self-healing. Was it fun? No. Was it necessary for growth? It most certainly was. As for Eating Art Work, the design/art/craft business… as of today, it’s still alive. There have been some unpleasant ‘learning experiences’, although none as painful as dealing with my dad. Hindsight isn’t as clear yet, but I can see that I’ve missed some opportunities to say ‘No’, instead of my predictable, ‘Yes’. It’s obvious that there were a few times when a door opened and I wandered or scurried through it, without pausing to think. Repeat that behavior often enough and even a ‘slow learner’ like myself, will catch onto the pitfalls and wise up. However, there has also been a steady trickle of positive outcomes from the EAW business venture. It is really gratifying to have strangers say nice things about my work, and sometimes buy it. While selling at various venues, I’ve met fellow vendors who were kind, open and generously shared their ‘experience, strength and hope’. My family and a few friends have been remarkably supportive and encouraging. I’ve confirmed that I have good business sense and have figured out how to do a lot of things on the Internet. No small accomplishment at my age. Most of all, I’ve allowed my creative self to play; trying out various ideas, ‘just because’ I had them. Now that is liberating! Which takes me back to the writing. In August of 2012, I took a break from the original blogging on the two sites, choosing to commit more time to the business of sales. I reasoned that autumn was the season when people bought gifts, so if I was going to ‘give it a go’, that was the time to make it a priority. Mixed results. Father still alive and needy, plus, to tell the truth, my enthusiasm and drive to ‘succeed in business’ were limited. But I tried and had modest sales. Exhausted in January, missing the energizing pleasure of doing the Food Life Story interviews and even minimal writing, I knew that I needed a break from sewing and selling kitchen towels. When I heard about an online course in Food Writing that was about to start, it seemed the logical thing to do, to focus and direct my writing self. I knew that what I was writing about food, my food life story, did not fit the normal categories considered Food Writing: restaurant reviews, recipe development, articles about chefs and food producers and trends. But it seemed close enough, so I climbed aboard. The class itself was ‘eh’. Having taught writing myself for 30+ years, I was dismayed by the style of the ‘teacher’. But there were a few women, from other parts of the country, whose writing and perspective intrigued me. We continued as a small group when the course ended, sharing our work electronically, with semi-regular telephonic ‘meetings’. So my writing juices were kept at least minimally stimulated through the spring and summer of 2013, through my father’s final illness, death and the aftermath. The duties that result from a parent’s death began to resolve themselves in the fall of last year. I was sewing towels again, for the holiday sales season, but there was also a little time and space for writing and, not surprisingly, I felt stuck. It’s all of a piece, isn’t it? Always is. The experience of shame that my father had personified and perpetuated all my life, until the final months of his life, became a burden that I knew I finally had to address. So, I was primed: emotionally clearer, with a modicum of time and momentum for writing my story. Then a few pieces of insight and information began to drop, noisily, into place. Books, and the thinkers and researchers who wrote them, came my way and like pieces of tinder, ignited spontaneously. I was on the brink, but still a-feared, reluctant to speak, as a writer, from my deeper self. Skating on the surface, using image and metaphor, dropping hints. I needed to be brave; to step up. Enter NaBloPoMo, a challenge from BlogHer and WordPress to post on a blog every day for the month of November. (National Blog Post Month) As I have seemingly done so many times on this journey that is my life, I decided, ‘on a whim’ to do it. I was ready to try out the deeper waters; to publicly poke around in the depths of my shame history and share the results of the excavation. In terms of writing, I think this was the toughest task I’ve taken upon myself: to write and post daily. Yikes; it was hard work. And the ‘inner work’, or shall I say turmoil, was messy, messy, messy. However, although I do not credit myself with drive or ambition, I am stubborn. I said I would do it, so I would do it, ‘even if it killed me.’ And I did it. I survived a glorious and agonizing month. As the calendar drew closer to December 1st, the question loomed… “What have I done? What have I begun? Do I just stop after 30 days?” That felt wrong; a waste of the momentum I’d created. And I knew ‘the work’ wasn’t done, whatever I meant by ‘the work’. So I’ve continued to post, twice a week, which has been fun and annoying and everything in between. Sticking to the practice of posting, as with meditation, writing ‘morning pages’ (a Julia Cameron technique) and practicing tai chi, is grounding. If I can do it/them on the days when it/they make no sense, when I don’t want to, then I have at least an inkling of who I am and where I am. I am in the middle of something. It is my life, it is this writing work, this exploring, exposing and sharing, owning my story. I receive such kind support regarding this blog, from friends and family. Thank you all for taking the time to read and sometimes respond to my thoughts. My readership is very small, and that is fine, quasi-public is enough exposure for me. 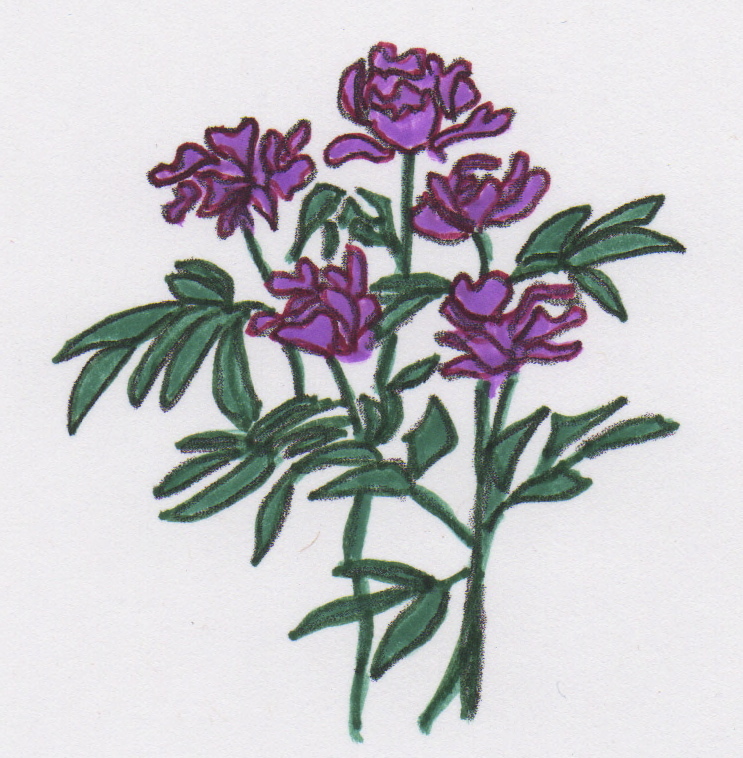 I’m still focused on fruits and veggies, but here are some peonies I drew.